Barry is President and CEO of Interaction Associates. He has 25 years of consulting experience in the performance improvement and learning industry. He has held the positions of Senior Consultant, Director of the Training Practice, Director of Consulting Services, and West Coast Regional Director. 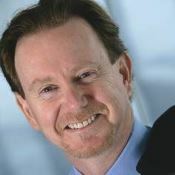 He is the designer and developer of much of Interaction Associate’s intellectual content, including leadership, teamwork, and facilitation workshops. He is also the founder of Zoom Collaborate. He holds a master’s degree in planning from University of California-Berkeley.